Famed for its luscious Caribbean landscapes, peaceful living, and its historical division into two separate Dutch and French territories, the island of St Martin has become known as a hotspot for those seeking a luxury retreat in the tropics. Naturally gifted with a concentration of beautiful beaches, world-class shopping opportunities, vibrant nightlife and a striking biodiversity to boot, there’s no denying that a St Martin villa rental is a perfect choice for a blissful vacation. 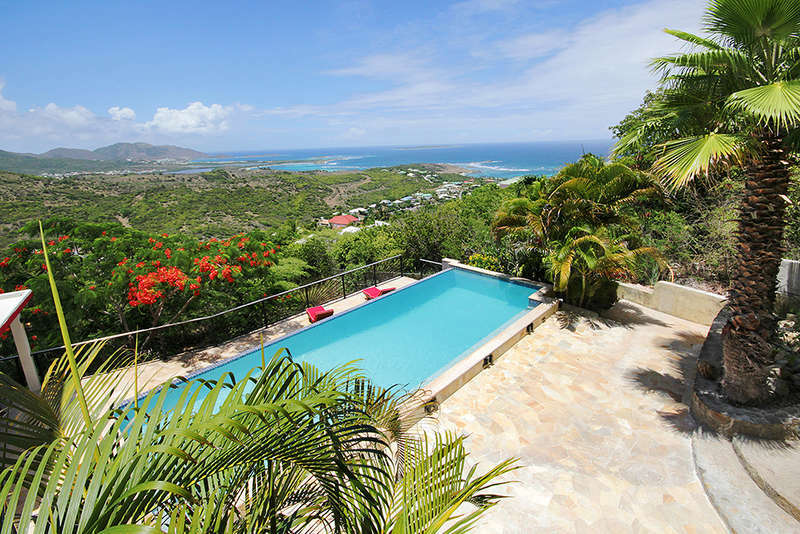 Rental Escapes are proud to offer a variety of exclusive luxury villas in St Martin that provide the finest in indulgence and seclusion, flanked by lush green landscapes and the deep blue Atlantic and Caribbean waters. Nestled in the West Indies towards the north of the Lesser Antilles, a vacation to this island provides the ultimate retreat from the stresses of contemporary life. Allow a deluxe villa rental to serve as your gateway to this charming destination and its many delights, immersing you in the natural surroundings and sending you into your personal haven. With its age-old division into two separate European communities, a visit to St Martin offers a unique insight into historical relations as well as a Caribbean vacation. Following its partitioning between France and the Kingdom of the Netherlands in 1648, the island has enjoyed a consistently tranquil exchange between the two areas, with a welcoming road sign the only way to tell that you’re crossing into different territory. Testament to St Martin’s international reputation as ‘The Friendly Island,' a total absence of border control allows travellers (and their goods) to cross over to either side and fully discover the island’s charm with ease. One of the main attractions of a luxury St Martin villa rental is the opportunity to explore the island’s outstanding variety of beaches, with broad, sandy bays, quaint turquoise marinas, and intimate, secluded coves all waiting to be discovered. No matter what your taste, you are sure to find a beach matching your individual preference. Indulge your instinct for romance with a few hours in the 2-person bay aptly named Lovers’ Beach, or if you fancy a spot of Hollywood-glitz in your beachside living take a trip to the "Saint Tropez of the Caribbean," Orient Bay (Baie Orientale), which is famed as a haunt for celebrity icons and glamorous living. Families are sure to find joy in the sheltered Friars’ Bay Beach and its variety of bars and restaurants, which equally transforms into a pulsating haven of rock and reggae come sundown. If nudist beaches are more to your taste, the French side of St Martin has a variety of scenic locations where you are free to bare all in beautiful locations. A year-round pattern of high temperatures and warm waters means the constant opportunity to bask by the ocean, absorbing the sun’s rays and letting your troubles slip away. Given the small size of the island, most St Martin vacation rentals on offer are sure to be located in proximity to a picturesque bay, providing you with idyllic sands and crystalline waters right on your doorstep. It is only natural that some of the best pursuits in St Martin consist of a wide variety of watersports, with every kind of water-based activity available to delight your sense of adventure. With surfing, windsurfing, jet skiing, SUP, kayaking, sailing, flyboarding and deep-sea fishing all on offer, the island is a haven for anybody who wishes to enjoy the clear blue waters. Otherwise, one of the greatest joys can be found in simply drifting along a bay with a mask and snorkel, observing the local marine life. With several luxury Rental Escapes villas in St Martin directly bordering bays and their turquoise waters, our travellers are sure to enjoy every opportunity for making the most of the island’s offerings. Should you prefer to remain dry on land, there are also many opportunities to explore St Martin’s impressive biodiversity and natural wonders by hiking, pony-trekking, mountain biking and quad biking. Delve into the island’s exceptional variety of flora and fauna, discover mangroves and their ecosystems, and observe lizards and iguanas soaking up the sun’s warmth. For those seeking more of a physical challenge, there are many scenic walks in the island going through natural reserves, some of which follow the ridges of St Martin’s highest point - Pic Paradis. There is also much to delight golfing enthusiasts, with lush courses dotted around the island’s landscape and gentle breezes to ease the sun’s heat as you pursue them at your leisure. Having explored the island and worked up an appetite, there are many fine eateries seeking to delight you with St Martin’s local cuisine and nightlife. The island certainly aims to impress with its exotic local fare, as with the finest fresh fish, lobster, shellfish, and meats at their disposal, the restaurant chefs of St Martin take care in crafting delicious dishes for their clientele. Take a step into the authentic Caribbean rhythm with a trip to a beachside lolo, relish the aromatic flavours of their grilled meats and spiced dishes, and taste the traditional Guavaberry liqueur of St Martin. With many Rental Escapes villas located nearby fine eateries and luxury bars, we aim to provide our clients with an effortless path to enjoying the island’s culinary traditions. When it comes to sensory delights after dark, the island is famed for its exceptionally vibrant nightlife, with the Dutch side of Sint Maarten particularly known for its festive scene. Try your luck in the glittering casinos of Maho Village, or revel in the island’s lively nightclubs. If you prefer to enjoy the night hours in a slightly more relaxed fashion, trendy beach bars line the island’s smooth shores, serving their decadent offerings through until the early hours. St Martin benefits from a very favourable set of taxation policies of no customs duties, VAT or other indirect taxes. Some truly world-class duty-free shopping opportunities await travellers, with the absence of taxes and relaxed importation laws allowing the island’s boutiques to provide a huge selection of goods at highly competitive prices. Alongside the host of independent stores on offer, the expansive West Indies Mall on the Marigot waterfront provides a concentration of well-known brands, while the Marina district and the Rue de Général de Gaulle are widely considered as prime fashion centres. Combining a luxury villa rental holiday in St Martin with a shopping trip is an excellent way to enjoy value and quality, leaving you with a selection of souvenirs to take home and enjoy beyond your stay on the island. Although St Martin’s nationality is technically European because of its French and Dutch division, there is no question that it retains a thoroughly Caribbean identity in the form of its vibrant culture and warmth conveyed by its people to travellers visiting their island. The island has a very rich cultural heritage, with the beat of tropical music found in every corner of the isle: soca, salsa, samba, steel band, beguine, reggae, zouk and even rock all maintain strong influences, delighting travellers with their infectious sounds. A bubbling artistic scene also accompanies the traditional cultural scene, with painters consistently inspired by the island’s outstanding beauty and radiant complexion. With a lively sense of hospitality at its heart, the St Martin atmosphere combines celebration and a joie-de-vivre tempo with laid-back relaxation. Nicknamed the "Friendly Island," the residents of this island happily welcome visitors, embracing them within their culture and sharing their customs with pride. Rental Escapes villas aim to provide you with a luxury experience approach, by offering idyllic retreats that remain an honest reflection of St Martin's unique vibe and character. St Martin benefits from the typical Caribbean tropical climate, making it an outstanding destination all year round. With average annual temperatures of 80.6°F that remain largely consistent – it’s rare for the temperature to go below 68 degrees – the steady climate ensures that St Martin is a safe bet for those who are seeking a warm vacation. The constant climate means that there are only two recognised seasons in the island – the dry season from December to April, and the wintering season from May to November. Mornings and nights are slightly cooler during the dry season (although still remaining pleasant), while the wintering season demonstrates higher temperatures during the daytime. There is no intense rainy season as such, although June to December can involve slightly more rain than the other times of the year. Practically speaking, St Martin is very easy to navigate regarding language, currency, and other essential considerations. While French and Dutch are spoken in the respective territories, English is also very widely spoken. Martinique Creole, Haitian, and Guadeloupe tongues also have a strong presence. The two official currencies in St Martin consist of the Netherlands Antillean Florin on the Dutch side and the Euro in the French territory, and US dollars are also accepted across the island. It is worth noting, however, that certain establishments can use a slightly unfavourable exchange rate when it comes to paying with the latter. When it comes to electrical outlets, the French side operates with European sockets while the Dutch territory uses the American style. Public transport is available around the island, although it is fairly uncontested that the best way to truly discover St Martin is with a car rental. Health wise, no vaccinations are required for travellers to enter the island, although it’s always wise to take precautions against mosquitos and the potential threats found in tropical flora and fauna. Rental Escapes are always pleased to assist with any inquiries about destinations or pre-departure arrangements and will take every step to relieve all of the stresses that can come with organizing a vacation. In order to allow our travellers the very best experience, our luxury villas in St Martin combine deluxe living with maximum ease in our booking process. Our villa specialists have a breadth of knowledge at their disposal to assist you with planning the best vacation for you, arranging a villa rental with the ideal location, services, and atmosphere. Allow Rental Escapes to sweep you away to the Caribbean breeze of St Martin and its carefree way of life, with a holiday of soothing tropical rhythms and indulgent living.